Hi everyone! In this article, I’ll be reviewing a hyaluronic acid serum by Gerbayer. Hyaluronic acid is something that most people come across when they’re first delving into the realm of skincare but often don’t know what it really does even after incorporating it into their routine. I have to confess that I did that as well - when I was first getting into skincare, I bought a moisturizer that had hyaluronic acid because someone told me it was a good ingredient and went about my life as usual. In doing my research for this article, I’ve learned a lot more about hyaluronic acid and I hope that by sharing it, you can make an informed decision about whether you’d like to incorporate it into your routine. To put it very simply, hyaluronic acid is something that naturally occurs in our bodies and allows our joints and tissues to function optimally. While it has various uses, it is often used as medication by people who face issues with their joints (e.g. individuals who have arthritis) because they do not have enough hyaluronic acid to lubricate their joints. In recent years, hyaluronic acid has become a buzzword in the beauty industry because of the effects that people have seen upon applying it topically to the skin. A good product containing hyaluronic acid can be a game changer in one’s skincare routine - it increases hydration levels in the skin, which can help to balance out oiliness and dryness. It can also allow for other ingredients to be better absorbed into the skin as it helps to retain moisture. It can possibly even reduce the appearance of wrinkles in those with aging skin. Importantly, hyaluronic acid can be a lifesaver for those with acne - acne sufferers tend to use harsh cleansers and medications (some of which may be prescribed by their dermatologists), which strip the skin of moisture and can actually aggravate their condition. It can help to combat acne and improve the appearance of scarring and hyper pigmentation. Moving on to the actual serum, the first thing I noticed was that it was very securely packaged. A lot of care had been taken to ensure that the product would not be contaminated or damaged by the time it arrived in the mail, which I appreciated. The serum was put inside a syringe that was sealed with a stopper - you can follow the process of opening up the serum (with pictures!) below. There’s also a list of steps that this serum comes with. While you can always use it as you normally would (e.g. cleanser, toner, serum, moisturizer), I felt that following the steps (at least as much as I could) aided in increasing absorption of the product. There’s quite a lot of product that comes in 1 syringe, and if you apply the whole syringe at one go, a significant portion of the serum will be wasted as it will just sit at the surface of your skin. By applying the serum a little bit at a time and allowing that amount to first be absorbed, you enable more of the product in total to be absorbed by your skin. I first cleansed my face using a cleanser prescribed by my dermatologist, but I skipped the 2nd step since I am yet to find a toner that does not irritate my skin. I believe that did not alter the overall effect of the serum as the cleanser I use is quite thorough. Moving on to the 3rd step, I roughly estimated 1/3 of the syringe and massaged the product into my skin until it was almost dry. I then used a hydrating mask that came free with the serum! It was very soothing and easy to use. 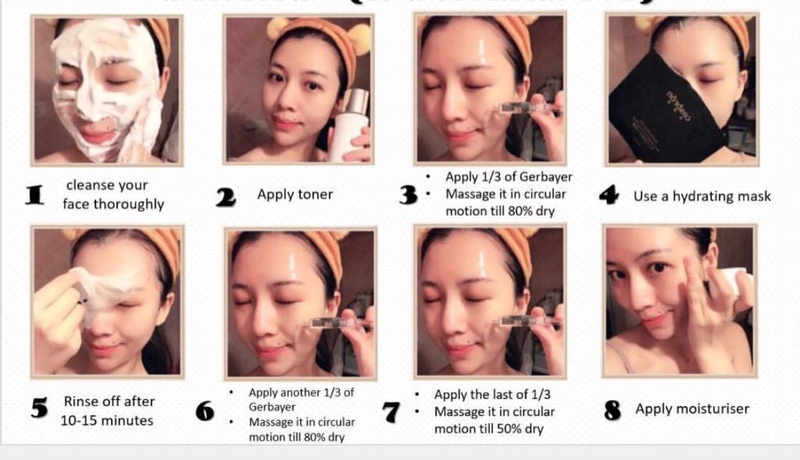 I was a little confused by step 5 since sheet masks are usually not washed off (to do so would be a waste of all the nourishing ingredients in the mask). Thus, I rinsed the excess off but left the rest of it on my face. I carried out steps 6 and 7 as listed and finished off by applying my favourite moisturizer. The texture of the serum was gel-like and applied easily. It also absorbed fairly quickly and was slightly sticky upon drying, but not so much that it bothered me. While following all of the steps did take nearly half an hour, I think it was worthwhile because I woke up feeling really refreshed the next morning. I didn’t have any adverse reaction to the serum, which was definitely a plus. It also left my skin feeling smooth and my cheeks (which tend to get very dry) were not flaky at all for the next few days. The effects of the serum definitely lasted a few days, and the people around me commented that my skin looked glowy. For a more intense treatment, you can follow the 8-step method for 5 consecutive days.